Our Garbanzo Bean Soup recipe is an authentic rendition of the famed Spanish classic. 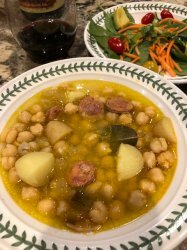 This one-dish meal consists of garbanzo beans (chickpeas), potatoes, green bell peppers, bay leaves and chorizo (Spanish sausage) which result in memorable, rustic soup. Our soup is based on a traditional Spanish recipe from the Galicia region of Spain. Galicia is a mountainous area in the Northern part of the country where a big bowl of hearty soup, some crusty bread and a glass of wine make a typical meal for the inhabitants of this rugged area. 30-Minute Taco Night! 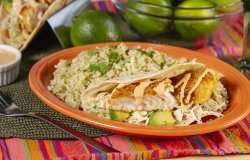 Prepared with Vigo Coconut Panko Breadcrumbs and Vigo Cilantro Lime Rice … Taco Night will be every night with this scrumptious recipe. 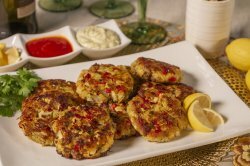 Made with Vigo Panko Bread Crumbs, these savory fritters are prepared in less than 30 minutes. Leave out the sausage for a vegetarian dish! Super Simple. Super Delicious. This recipe, made with Vigo Olive Oil, is full of rustic flavors and perfect for the holiday season. Mediterranean taste in just 15 minutes! Vigo Feta, fresh herbs and colorful veggies make this recipe a refreshing break from your everyday dish. Perfect as a full meal or as a side dish for the holidays. A festival of flavors! Made with Vigo Roasted Red Peppers, this exotic and aromatic recipe is simple to prepare and sure to impress! Dinner never has to be boring! Try something new with this tasty Teriyaki Chicken Rice Bowl recipe! It features our new Vigo Coconut Ginger Rice and has everything you need to prepare something different for family dinner night! Shrimp Fried Rice in just 30 minutes! Made with our aromatic Vigo Jasmine Rice, you’ll never want to order takeout again after preparing this delicious homemade version. Yes, it’s true! Seafood Paella in less than 30 minutes! Prepare this impressive and delicious feast with ease. Our Vigo Paella Valenciana is perfect for family time or upcoming holiday gatherings! 4 ingredients and 25 minutes get you an incredible one-pot meal for your family. Weeknight dinner couldn’t be any easier than Vigo Red Beans & Rice with Sausage!